One of the largest icebergs ever recorded broke free in Antarctica. It is called the Larsen C.
Scientists are saying another collapse might have catastrophic consequences, according to the Independent. Lucky for us, the iceberg is still floating in the ocean so it won't directly add to sea levels. It's about the size of Delaware. But we're not necessarily totally in the clear. A section of an iceberg ? about 6,000 sq km ? broke away as part of the natural cycle of iceberg calving off the Larsen-C ice shelf in Antarctica in this satellite image released by the European Space Agency on July 12, 2017. Courtesy ESA/Handout via REUTERS ATTENTION EDITORS - THIS IMAGE WAS PROVIDED BY A THIRD PARTY. 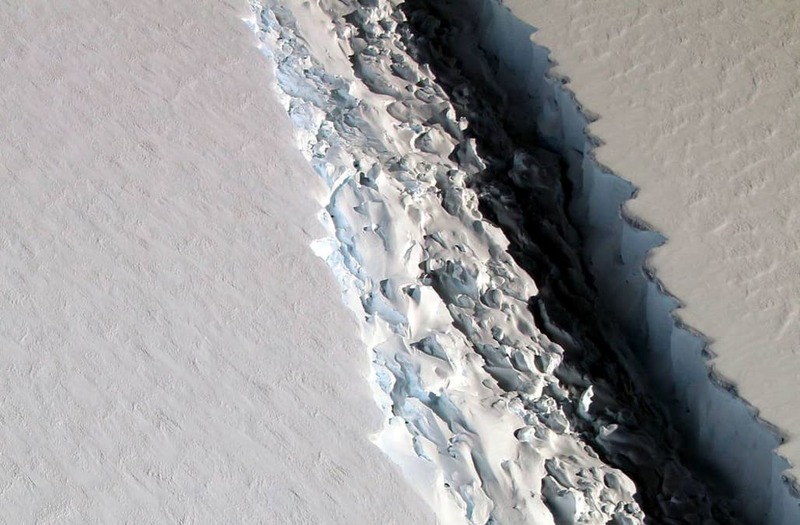 An oblique view of a massive rift in the Antarctic Peninsula's Larsen C ice shelf is shown in this November 10, 2016 photo taken by scientists on NASA's IceBridge mission in Antarctica. Courtesy John Sonntag/NASA/Handout via REUTERS ATTENTION EDITORS - THIS IMAGE WAS PROVIDED BY A THIRD PARTY. EDITORIAL USE ONLY. Antarctica Research Professor Nancy Bertler warns the collapse of another iceberg, the Ross Ice shelf, could increase the speed of land ice flowing into the sea. That could consequently raise sea levels by 3.3 meters...That's almost 11 feet. A sea level rise of that capacity would dramatically alter coastlines all over the world. That could cause large pieces of land that are now inhabited, to disappear. Looking back at similar situations, like the Larsen B Ice Shelf which collapsed in 2002: that didn't affect sea levels, however, he melting of the ice behind the shelf has sped up. There is no telling whether the Ross Ice shelf is prone to a break-off but Bertler says it has been found to be "very sensitive in the past and capable of rapid change."